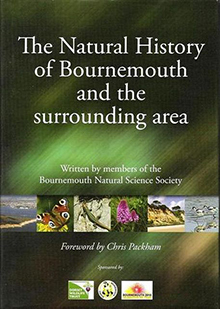 This book supersedes the Bournemouth Natural Science Society’s original 1914 edition with up to date information covering Bournemouth and Bournemouth’s local environment. A great deal of the history chapter reveals the changes that have occurred to the area in the 200 years since Bournemouth was founded in 1810. It is beautifully presented with lovely glossy pages and full colour photographs as well as maps and diagrams relating to the History of Bournemouth. It includes local archaeology, geology, and geomorphology. The book has very wide and diverse information including earlier land owners, the expected arrival dates of migrating birds, Isaac Gulliver, the well-known smuggler of the19th century, Ordinance Survey references to many old common areas and records of non-native animals such as deer and big cats. Surprisingly the big cats are reported to have been seen in the area as late as 2005! The chapters delve into the study of trees, plants and fungi, animals, insects and birds and the marine life of the area which extends from Christchurch Bay in the east, Kimmeridge in the west and everything in between. There is a comprehensive glossary, an index of photographic acknowledgments, besides a section with further referencing of subject matters that are discussed in each chapter to other publications. Chris Packham ends his foreword suggesting he believes the book comes from the hearts of the members and not from their hard drives of computers. This book is well worth owning, whether to read, browse or just dip into and definitely a book that would make a wonderful gift.